This session was a fun session. Not only did we do do their “couple” photos at their wonderful Carter-Finley Stadium, we also were present when Stephen popped the question to Jamie. This is what made the day extra special, in case you werent aware, ha! Jamie and Stephen have been together for about a year and a half now. It’s funny, because they actually met while we were on our annual camping trip in 2017. With a few nudges, it ironically worked out that Stephen had to drive Jamie up to Virginia where we normally go tubing at. I am lieing if you think I did not plan this out. Hello, it’s me. I thought, these two would be perfect together! I am going to make it happen. If you havent caught on already (by the main photo), Stephen is my brother-in-law, and Jamie just so happens to work with one of my girlfriends. Match made in heaven. I am just happy it worked out, because if it didnt then I would have years to feel ashamed. Stephen knew he wanted to propose to Jamie, but wanted to make sure it was special and meant something to the both of them. The best thing? Jamie and Stephen LOVE the wolfpack!! Yes, all of us are a Wolfpack family! 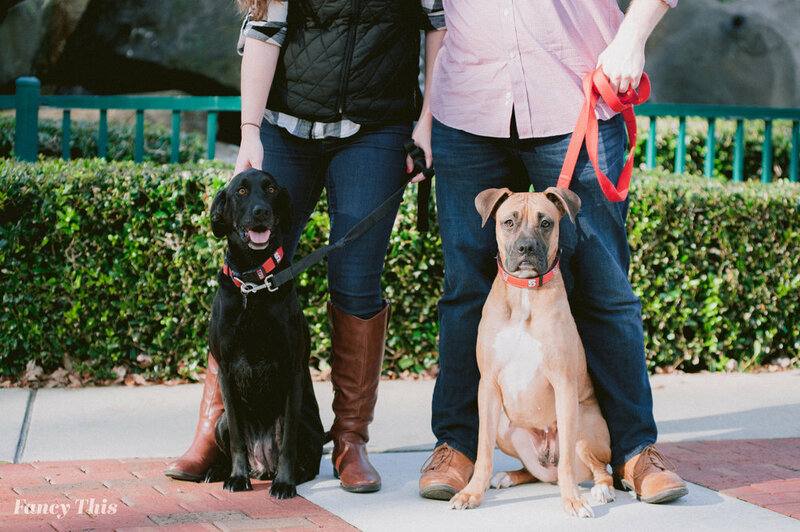 Their love goes so deep that they even named their pups Carter and Finley. Stephen wanted to propose to Jamie in front of the statue, and I thought it was perfect. With the help of my husband and I, we formed a plan to take their fall portraits together—just in case they wanted to send out Christmas cards later in the year. I was under the impression that Stephen would propose earlier in the session, but he didnt. Out of surprise, at the end of their session, he dropped to one knee and asked Jamie to marry him. I cried a little bit, and Jason did, too. It was surreal to see such a special moment take place right in front of our eyes, and we were just glad to see two people we love and adore take the next step. Congratulations, Jamie & Stephen! We are so excited for your upcoming wedding. And Jamie, there is still time to run if our family is too crazy for you. Exciting News! We are Expanding!